Crysis 3 is a first-person shooter video game under development by Crytek, published by Electronic Arts for Microsoft Windows, PlayStation 3, and Xbox 360 set to be released in February 2013. Accidentally revealed by Electronic Arts, the game is the third main installment of the Crysisseries, and a sequel to the 2011 video game Crysis 2, and will run on the CryEngine 3 game engine. BioShock Infinite is an upcoming first-person shooter video game and the third game in the BioShock series. Previously known as “Project Icarus”, it is being developed by Irrational Games for a March 26, 2013 worldwide release on the Microsoft Windows, PlayStation 3 and Xbox 360platforms. BioShock Infinite is not a direct sequel or prequel to previous BioShock games, taking place in an earlier period and different setting, though it features similar gameplay concepts and themes. 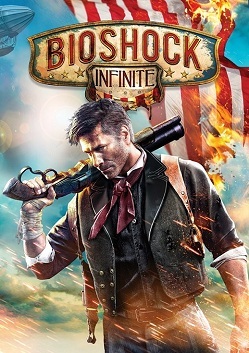 Building on the ideas of American Exceptionalism in the early 20th century, the game’s protagonist, former Pinkerton agent, Booker DeWitt, is sent in 1912 to the floating air-city of Columbia to seek out a young woman, Elizabeth, who has been held captive there for the last twelve years. Though Booker rescues Elizabeth easily, the two are pursued by warring factions on the collapsing city: the Founders that strive to keep the city for pure American citizens, and the Vox Populi, a hodgepodge group of several smaller factions trying to seize control from the Founders. Booker finds Elizabeth to be central to this conflict, and that she also holds strange powers to manipulate rifts in the time-space continuum that ravage Columbia. Ken Levine, the lead designer for the game, took inspiration for the story and setting from both historical pieces at the turn of the 19th century, as well as more recent events including the “Occupy” protests. Levine took an unorthodox approach with the voice actors for Booker and Elizabeth, Troy Baker and Courtnee Draper, respectively, by developing the script and details of the story alongside them during their voice work, allowing them to help define the characters and deliver more convincing performances within the game. The player controls Booker throughout the game, eventually teaming with the computer-controlled Elizabeth. Like previous BioShock games, the player uses a combination of weapons, psychokinetic powers granted through “vigors” and “nostrums”, and Elizabeth’s own powers to fight off hostile foes and make their way through Columbia. In contrast to the limited spaces of the underwater city of Rapture, the open-air city of Columbia provides for more combat challenges, including combat that takes place aboard the city’s Skyline rollercoaster-like rail system. The game will also feature a “1999 Mode”, harkening back to games like System Shock 2 where decisions made by the player will have a more permanent impact on the game, possibly leading the player to an unwinnable situation and requiring a restart from an earlier saved game. BioShock Infinite has received early pre-release attention, winning several awards including the “Best of Show” at the 2011 E3 show.